Heat oven to 350ºF. Line 12-inch pizza pan with foil; grease foil with shortening or spray with non-stick cooking spray. Break cookie dough into 2-inch pieces; arrange evenly in pan. With floured fingers, press to form crust. Bake 16 to 18 minutes or until deep golden brown. Cool completely, about 30 minutes. Use foil to lift crust from pan. Carefully remove foil from crust; place crust on serving platter or tray. 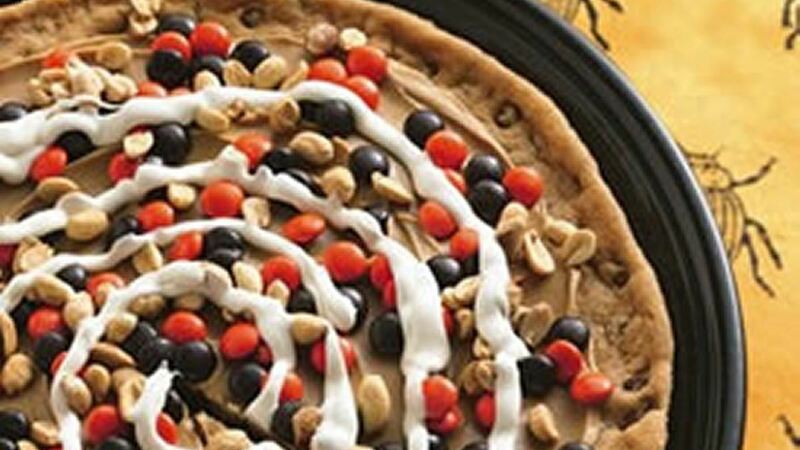 Spread peanut butter over crust. Sprinkle with chocolate candies and peanuts. In small microwavable bowl, microwave frosting uncovered on High 10 to 15 seconds or until thin enough to drizzle. Transfer to small resealable food-storage plastic bag. Cut small hole in 1 corner of bag; drizzle over cookie pizza. Cut into wedges or squares. Tip: Up the fear factor, and pipe the frosting in a spider web design.